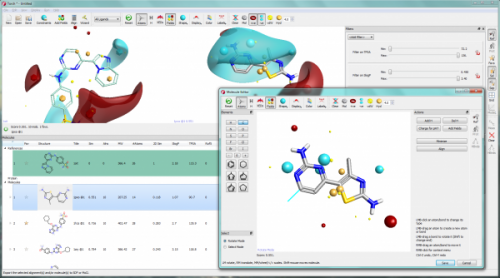 One of the key strengths of Cresset’s method of analyzing the interactions of small molecules is the ability to encode the field information of a molecule in a manner that is both efficient enough to be handled computationally, and accurate enough to remain meaningful. We do this through representing molecular interactions as field points. This screenshot of Torch shows the representation of compounds as 2D structures in the results table (bottom left), with their force field patterns (top), and with their field point representations (bottom right). 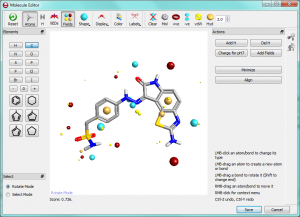 A 2D molecular structure is very useful for synthesis planning and the quick recognition of structural type. 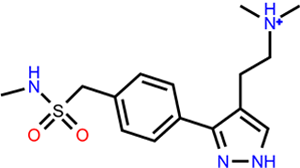 It is also used for IP protection and has traditionally been widely used in computational chemistry. 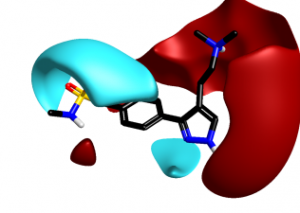 However, it is not particularly useful for understanding molecular shape and the interactions of small molecules with proteins. The 3D force field of a molecule is made up of its electronic, hydrophobic and shape properties. This ‘skin’ of forces is how molecules ‘see’ each other and the basis on which they interact. As such, it is extremely valuable in understanding the complex characteristics of molecules and for understanding how molecules interact with proteins. Detailed 3D force fields based on shape, electrostatics and hydrophobicity are invaluable for the detailed study of a small number of key compounds in order to help chemists interpret results and understand possible causes for changes in activity. However, calculating molecular force fields is very computationally intensive. The vast amount of data involved means that full molecular force fields cannot be used to analyze large numbers of molecules, for example when searching databases to find matches. A field pattern is a representation of the electrostatic, hydrophobic and shape properties of a molecule – the ‘protein’s eye view’. Field points are a condensed field pattern. They encode biological activity, expressing the most important field information in a computationally viable form. 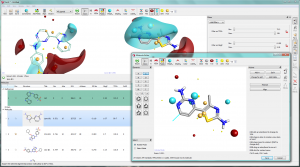 This allows for the rapid analysis of collections of molecules, whilst retaining the ability to understand shape and electronic properties. 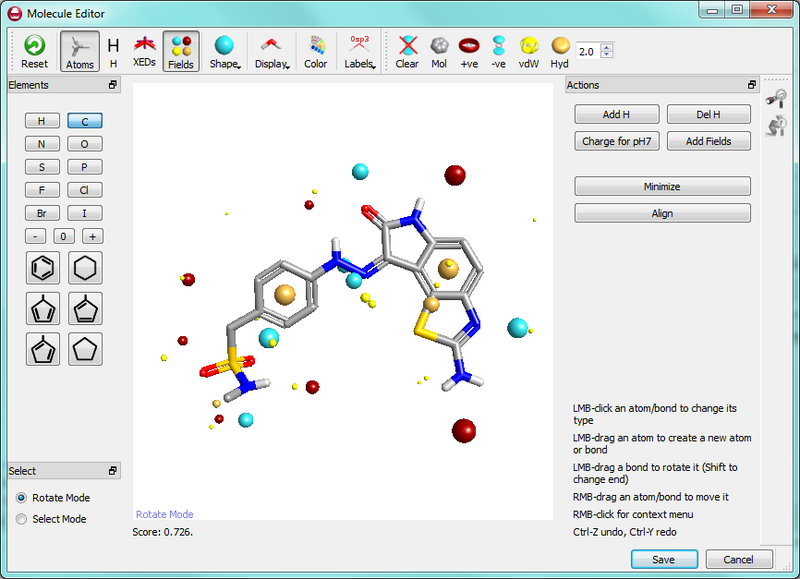 This is a typical view of a molecular structure plus the 3D field points. The red points correspond to a positive charge and the blue points to a negative charge. The yellow points represent shape and the orange points hydrophobicity. Their sizes correspond to the strength of the force at that point. Read more about how field calculations are carried out to ensure the field point representations are accurate: Calculating accurate field patterns.